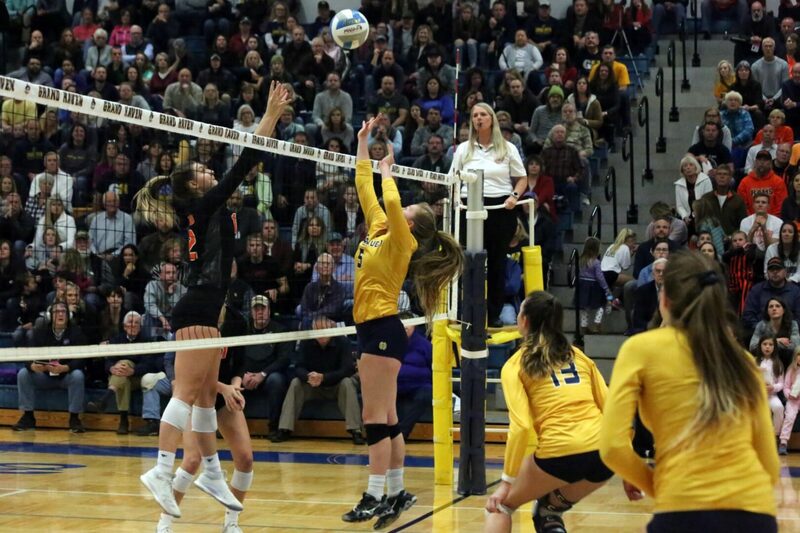 GRAND HAVEN – It was going to take a perfect effort from the Grand Haven volleyball team to capture a Division 1 regional title on Thursday. But as well as they played early on, it didn’t quite happen for the Bucs. They fought hard for two very close sets, but ended up losing to Rockford 3-0 in the regional finals in front of a packed crowd on their home court. The set scores were 25-23, 25-22, 25-10. Grand Haven finished the season with a 35-19-2 record. The two teams from the O-K Red Conference faced each other twice during the regular season, with Rockford winning both in four sets. Despite those positive results, Rams coach Kelly Delacher knew his team would have its hands full. 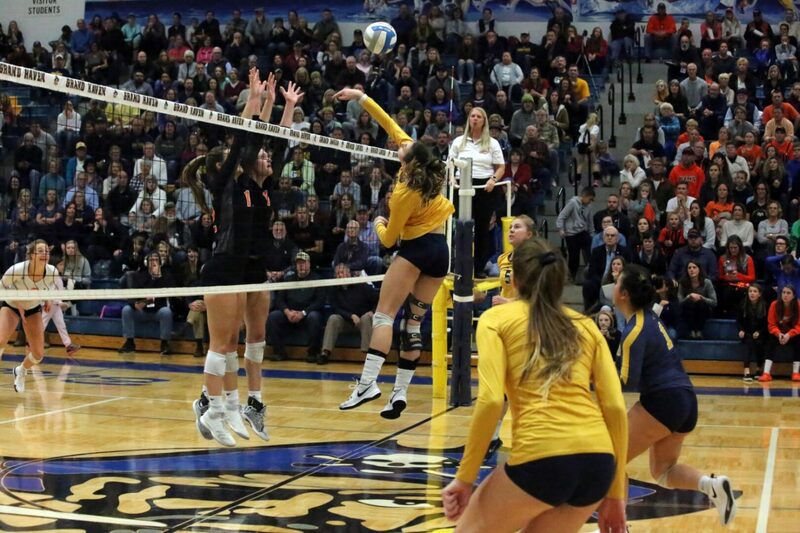 The opening set saw Rockford jump out to an early lead, until the Bucs’ Mackenzie Gross and Ashley Slater recorded kills, and Sarah Knoll had a block, tying the score 23-23. But after a time out, the Rams blocked a Slater shot for a 24-23 lead, then a kill by Emily Webb gave Rockford the first set. The second set went back-and-forth before a Slater kill evened the score at 22-22. But Rockford finished things off with three straight points, highlighted by a kill from Lindsay Taylor and a set-finishing ace from Emilee Karelse. “We didn’t pass our best tonight, and I felt we gave them – especially in the first set – some free points,” Smaka said. Grand Haven needed to regroup and rally in the third set to save its season, but instead got a heavy dose of Taylor. The Rams’ senior outside hitter had five of her match-high 31 kills in the third set, and won the final 10 points of the match on her serve. Slater led Grand Haven with 11 kills, Gross added eight and Knoll finished with five. Ashlyn Hall had 27 assists for the Bucs and Baby Hang totaled 13 digs.